Sorry, been busy today and home late. 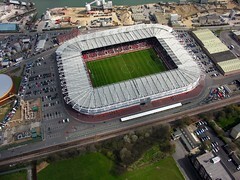 A successful flyby over St Mary's Stadium this afternoon I'm told it's on the tele but haven't seen it yet. Any lower and we would have been in the stadium. Much of the western and southern side of Southampton was covered but the north-east was barred because of incoming airport traffic. Click on the stadium photo to see the others, which can be downloaded in high resolution if you wish to have copies. A bit tricky for us to fly, as the stadium is right on the final approach to the airport and so our thanks to air traffic control for making it possible and slotting-in the display between landing flights.